While the original Cyrillic Russian in the MiG-23's cockpit is authentic, if a red light comes on in the cockpit, we'd like it to come on in English. Labeling and placarding the cockpit for safety, and changing the altimeter from meters to feet are some of the steps necessary before we can fly the aircraft in U.S. Airspace. The MiG-23 is part of the first generation of Soviet aircraft where cockpit ergonomics were given major consideration in the design. The layout is clean and logical but at the cost of increased complexity of the mechanical "switchology". Like the rest of the MiG-23, the Caution and Warning panels are rugged and well thought out. The main panel shown here can be removed with a single screw, making it easy to change the 28v light bulbs behind it. The "day/night" knob adjusts the brightness of the lights and doubles as a "push to test" button that illuminates all bulbs so the pilot can check if they're burned out. Here the panel is seen from the back with encapsulation for each light bulb so that there is no "light bleed" from one indicator to the next. The brightness adjustment knob carries through the "push to test" action to a button behind the panel. A spring returns the knob to its normal position. The panel is continuously adjustable from fully bright "day" mode to a very dim "night" mode. Unusually, this is done with a mechanical slider that blocks the amount of light coming to the panel rather than by regulation of the voltage intensity being applied to the lights. The slider is shown in this photo in both the fully open and fully closed positions. The first step to converting the panel to English is to document the existing panel both for the museum's records and to facilitate translation to English terms that are familiar to pilots. There are two primary panels, one dealing with engine issues and one primarily dealing with the six fuel tanks (plus external drop tanks) that are automatically managed for the pilot. Additionally, a panel of "trim neutral" green lights and a set of information lights on the gear tree need to be translated. The MiG-23's unique "swing wing" design is brought up on the panel's "SPREAD WINGS" light. As it is virtually impossible to land the MiG-23 with the wings swept to any degree at all this light exists to alert pilots to the danger that the gear have been lowered and the wings are not in the full forward position. The designers at MiG chose a panel construction that easily lends itself to conversion to English while retaining the "feel" of the original panel. 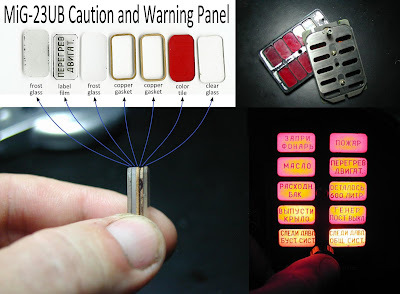 Each indicator consists of a seven-layer sandwich of frosted tiles, the label with the wording on a thin "film", copper gaskets to provide a snug (vibration proof) fit, and a glass "color" tile that is red, yellow, or green as relates to the urgency of the information being provided to the pilot. 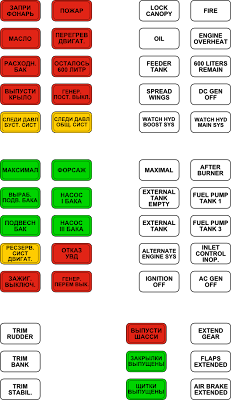 Red tiles illuminate for emergency situations (fire, loss of an electric generator, or very low fuel state), yellow for situations needing the pilot's attention (hydraulic system anomalies), and green for information not requiring action (such as when a fuel tank reaches an empty state). Additionally a master caution annunciator and two red master caution lights are placed in the pilot's "heads up" field of view. The blinking of the master caution system can be canceled by pressing the master caution annunicator light/button. 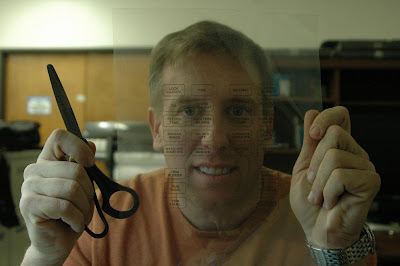 After some discussion on translation, a final panel is created with Inkscape for laser printing on transparency film. Here Jon is shown with the translated film and scissors on the, "You want to fly it, you cut them out!" plan. With the advance technology we have right now everyone has its easy access on the different fields for an easier work.